Foam may be rolled/folded/compressed for shipping - please allow all foam to lay flat for at least 24 hours before installation. Due to the manufacturing process of foam, sizing may not be exact between pieces - some variances can occur. Contour Tiles ± 1/4" ± 1/4" ± 1/4"
Pyramid Tiles ± 1/4" ± 1/4" ± 1/4"
Corner Blocks	 ± 1/4" ± 1/4" ± 1/4"
Bass Traps ± 1/4" ± 1/4" ± 1/4"
Your local hardware store will have tubes of adhesive appropriate for the installation of foam. Many apply the foam to a backer board (cardboard, plywood, etc.) and then mount/hang the backer board - this method allows the foam to be moved or removed in the future without damage to the foam, or the mounted surface. Pyramid Foam Installation - side by side alternate, or spaced. Contour Foam Installation - side by side alternate, or spaced. Egg Crate Foam Installation - not suggested for side by side installation. 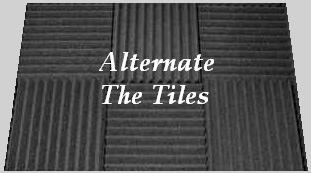 If installing foam side by side it is suggested to alternate the tiles and best to leave at least a 1/8" gap between the tiles to allow for slight differences in tiles sizes.